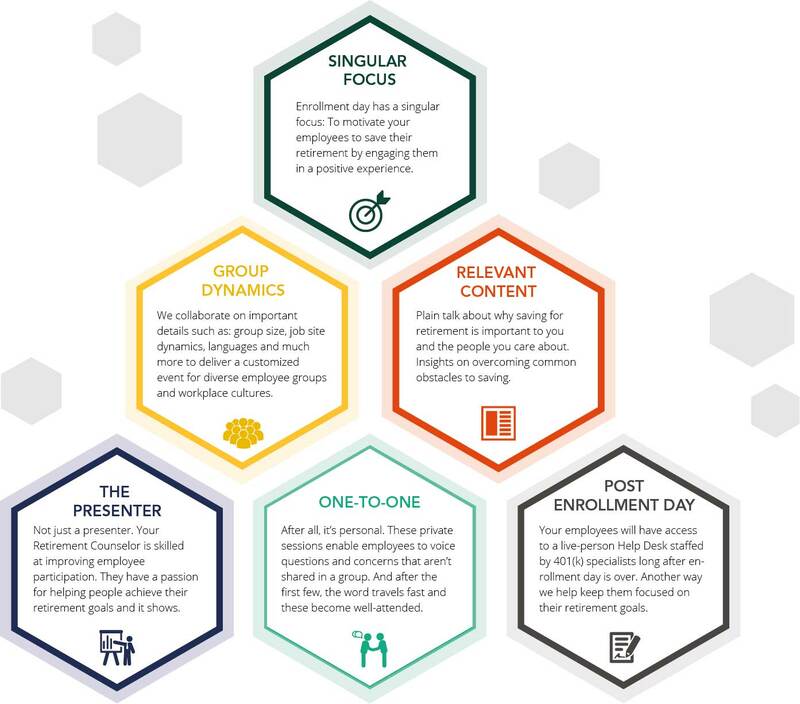 We design your enrollment day to be tailored to your specific workforce and culture. As a client, you and your employees will have a completely different experience enrolling into your business’ 401(k) than ever before. Enrollment day, the day when employees join their new 401(k), is very important to us. And we take a unique approach. Your Retirement Counselor will work with you to design your enrollment day to be tailored to your specific workforce and culture. Whether the enrollment is held in a warehouse or in your front office during morning or night shifts, we will coordinate with you to determine the best approach for reaching your employees. * Fisher 401(k) Solutions enrollment data as of 1/1/2019. We believe the success of our enrollment strategy is all in the chemistry. We combine these six elements in optimal ways to meet the unique needs of your business. And the end result is a higher level of employee participation and contribution rates. No. 1 motivator among workers to learn more about saving and investing for retirement: making content easier to understand. In a recent study, 66% of plan participants cited that in-person meetings with a financial professional are by far the most effective communication vehicle for motivating them to make positive changes to their retirement savings. This is one more area Fisher Investments 401(k) Solutions stands out: We come to your site(s) and meet with any employee interested in a one-on-one meeting to help them figure out their retirement goals and set up their 401(k) plan.